Latest News Coverage of Essae-Teraoka Pvt. 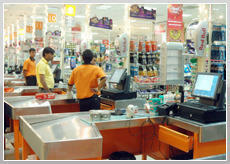 Ltd.
Spencer's surges ahead with Essae for POS solutions! Spencer’s Retail, one of the earliest retail chains in the country to enter the Supermarket business, has successfully installed more than 150 units of Essae’s flagship POS system, POS-375. This model uses a high performance DUAL CORE processor, which has greatly improved the check-out process and customer satisfaction in high footfall Hypermarkets. By going with Essae POS, the customer also upgraded to a large 15” touch screen system which makes the check-out operation easy and user friendly. The system is versatile and easily connects to a wide variety of external peripherals such as printer, weighing scale, barcode scanner, customer display, MSR, keyboard and cash drawer. Essae’s strong service network of 47 branches and over 350 dealers adds high value to Spencer’s in ensuring a high uptime of these mission critical systems. So far, Essae has already successfully installed more than 150 of these units and the balance 1100 units will be completed very shortly. The Karnakata model for the computerization of the PDS is indeed a live and successful working example which many other states can easily follow without much experimentation. Lucas-TVS, one of the most prominent names in the Indian Automobile Industry, recently installed 16 of Essae’s new GPS Synchronized Clock solutions. The clocks installed earlier were highly unreliable and needed constant settings and adjustment. Essae GPS Clocks are synced to the atomic time provided by a network of GPS satellites and fully communicate via Wireless technologies, thereby making installation faster. This innovative solution does not need any settings or adjustment anytime. By installing these clocks, Lucas-TVS has seen a significant rise in the awareness of their staff to time discipline in meetings and schedules. T. A. Pai Institute of Management (TAPMI), Manipal is one of the premier management and educational Institution in the country. They approached Essae with a unique problem of non-uniformity in all the clocks installed in their campus. There was a constant debate/argument between the students and staff on the correct time. Essae installed 39 units of GPS clock in their classrooms,IT centre, Admin and Faculty rooms,cafeteria etc. After installing these clocks, time is uniform across the campus and TAPMI is extremely delighted with the results achieved so far as it removes all ambiguities related to the correct reference of time. Essae received a large order for 149 units of Information KIOSK from the Central reserve Police Force (CRPF). This KIOSK is designed to be extremely user friendly and simple to use with a large 19-inch Vandal proof Touch Screen monitor, powerful CPU and robust housing. They are connected to the main server for online data access. These KIOSKs were procured under the DGS&D Rate contract and are being used in various battalions of CRPF to provide HR information services to cadets such as salary details, leave, PF, Pension etc. SUBWAY upgrades to Essae's new POS hardware Solution! SUBWAY, one of the fastest growing QSR brands globally and in India, has successfully installed Essae’s POS-680 at their stores in India. Essae POS-680 uses a high performance Intel Core i5 QUAD CORE processor that substantially shortens billing time and increases customer satisfaction tremendously, especially during weekends and rush hours. Apart from this, the POS-680 sports a new generation TRUE FLAT/BEZEL FREE Touch screen, which is IP-54 grade Water/Dust resistant. It also features a Second RAID Hard disk for higher Reliability. All these features combined ensure a high performance, low downtime and Customer delight for Subway. By going with Essae POS-680, SUBWAY also upgraded to FUTURE READY POS HARDWARE which speeds up the billing operation tremendously and takes care of future scaling up of the POS software. The system is very powerful and yet at the same time very versatile and simple. SUBWAY POS software runs on the Windows operating system. Apart from successful validation with all leading third party POS Software, Essae POS-680 easily connects and Integrates to a wide variety of external peripherals such as POS Printer, second Customer display, Integrated MSR and a highly secure POS-controlled Cash Drawer. Essae’s strong service network of 44 own branch offices armed with over 250 Service engineers further add significant value to SUBWAY’s operations in India, thus ensuring a very high uptime of these mission critical systems. After success with Spencer's, Foodword, METRO and SPAR, Essae-Teraoka is pleased to announce the addition of two more new and prestigious key account retail customers during the year for the SM-100 solution. Reliance Retail Limited (two brands “ Reliance Fresh ” and “ Reliance MART”) with more than 1,000 stores and Aditya Birla Retail Limited (brand “more.”) with more than 500 stores are amongst the fastest growing Indian owned retail chains and both have selected the SM-100EV+ for their new store expansion plans. Those stores are a combination of Hypermarket and Supermarket formats. The superior value proposition of DIGI products combined with high level of technical support from Essae won this business. Essae also provides a locally developed and customized store server application called “DATALINK” which takes care of special barcode formats and high-speed data transfer function in the store. Another critical decision factor for both customers was Essae’s strong sales and service network of 47 branches and over 300 dealers throughout the country, which is very crucial for supporting for retail market in india. DIGI and Essae-Teraoka deeply value and appreciate the business and association with Reliance Retail and Aditya Birla Retail and look forward to a mutually beneficial and long term relationship, in the future, we also look forward to being associated with these customers for POS System as well.